Book Club New Date Announced! And bring your suggestions with you. See you there! Although our administrator and event coordinator (yours truly) was a preplanned no-show for the book club, most of the other confirmed attending membership backed out at the last minute. As a result, we’ve had to cancel the meet and will be rescheduling it for some time in the future. If you’re interested in attending and haven’t read the book, now’s your time to catch up. We’ll let you know when it’s going to be, at least a week in advance. So see you on the other side! The members only writing competition has gone live. Details available here. The caveat? You need to be a registered member, but the incentives for scoring a Desi Award are many. For starters, we’re going to bring out a special issue of PAPERCUTS specifically for the best five entries submitted; entries will be judged on creativity and general well togetherness of the piece. Participants have six different titles to choose from and one limitation: they have to include the title in their piece, every word of it. How they do it, is entirely up to them. Along with the above, we’re gearing up to compile and publish our first anthology; winners of the competition (Desi Awards will go to the Best Poet and Best Writer) will be guaranteed a spot in the anthology. Thirdly, winners will get a certificate, a proper certificate of participation along with their names and the award won. They’ll be encouraged to frame it for display in their homes. And finally, as a forum member participants will get a forum medal in their honor that they’ll carry with them forever. Something along the lines of ‘Best Poet, Desi Awards 2009′. If you’re suitably interested in the above, why not register if you haven’t already and give it your best shot? Fresh registrants should have at least 10 posts to their name, and should be fairly active on the community in the run up to the deadline. We don’t want members simply registering for the competition and then forgetting all about us later. Members who truly appreciate the written word, are who we’re looking for, and who the competition truly stands to represent. One of the many advantages will be direct publication, without having to go through our very brutal workshops. Needless to say, the piece has to be very well put together to qualify. We are insanely picky that way. We are going through with the book club and The Exorcist as our pick of the month, on November 21 at the Paper Microphone Cafe at 5.30 pm sharp. We will also be picking the next selection, so if you know interested people in the city, or will be attending yourself, bring along some easily available books with you, as suggestions. We had to change our original book selection because Divisadero wasn’t easily available. 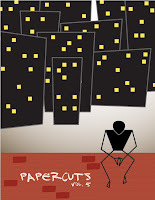 And now, take a look at our first “official” cover for the latest issue of Papercuts; Vol 5 or our Fall issue. Like, dislike? Post in the comments, below!